Millions of people drive their U.S. or Canadian plated vehicles to Mexico each year for vacations, holidays and to visit family. IIG provides the simplest online application that allows you to obtain a quote, purchase a policy and hit the road in minutes. If you have your driverâ€™s license, current U.S. or Canadian policy information and a credit card ready you can get a quote now. 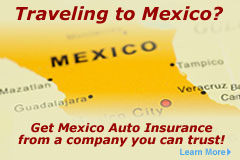 IIG also has a homeowners insurance policy for Mexico that is unrivaled. Created to work much like a U.S. or Canadian policy, homeowners can now have a policy that is easy to understand with coverage they expect. With IIG you get the coverage you expect no matter where you are.